The GOP debate on Thursday appeared to be a gang up on front-runner Donald Trump by his US Republican opponents, Marco Rubio and Ted Cruz in what tends to be a last minute bid to keep the billionaire from winning next week’s Super Tuesday contests which could determine who would clinch the presidential ticket. The CNN-hosted debate at the University of Houston was the two first-term senators’ last, best chance to try to shake up the race for the Republican nomination. The contest is dramatically shifting toward Trump, who is leading in opinion polls in nearly all 11 states set to make their choices on next Tuesday. 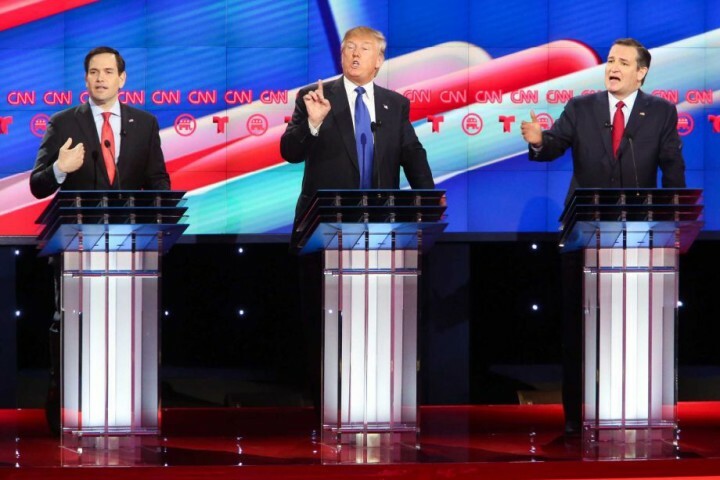 Rubio and Cruz landed blows on Trump, took some withering fire in return and may wonder why they did not pursue such a strategy in the debates of past weeks and months when former Florida Governor Jeb Bush, now out of the race, was the lead Trump attacker. A confident-sounding Trump was unbowed and dismissed the attacks from his center-stage position. He declared Rubio a “choke artist” for a faltering debate in New Hampshire, again labeled Cruz “a liar” and urged his rivals to take their best shot. Rubio, who got some momentum with a second-place finish to Trump in South Carolina last Saturday and has picked up some Bush supporters, gave his most aggressive performance to date. The senator from Florida wants to be the last Trump opponent standing and perhaps stretch the contest to the Republican nominating convention in July. He brought up Trump’s four past bankruptcies and his use of imported Polish workers to work at a Florida resort, and pointedly suggested the New Yorker would not be where he is today in the real estate business without a family inheritance. Significantly, Rubio sought to raise doubts about the depth of Trump’s policy knowledge, a point of attack that Trump’s critics in the Republican establishment have been urging candidates to pursue for months. Rubio pointed out that Trump’s sole plan to replace and repeal Democratic President Barack Obama’s signature healthcare law is to allow insurance companies to operate across state lines. When Trump repeated the same point twice, Rubio interrupted. “Now he’s repeating himself,” said the senator, who was skewered at a debate in New Hampshire last month for robotically repeating his talking points. Cruz, who needs to win his home state of Texas when it votes on Tuesday, also piled on Trump, saying his rival would be a weak Republican opponent to Democratic candidate Hillary Clinton in the Nov. 8 general election because he had donated to the Clinton Foundation founded by her husband, former President Bill Clinton. Trump ridiculed Cruz for his inability to win more than the early voting state of Iowa and taunted him for being behind Trump in opinion polls in Texas. Since a second-place finish in Iowa, Trump has won New Hampshire, South Carolina and Nevada. “If I can’t beat her (Clinton), you’re really going to get killed aren’t you? … I know you’re embarrassed, but keep fighting,” Trump said. The crossfire was so intense that CNN moderator Wolf Blitzer lost control of the proceedings at times. Among the other two candidates on the stage, Ohio Governor John Kasich turned in a positive performance with an optimistic message, hoping Rubio and Cruz will falter and he will end up as the central Trump alternative. Even with his bombast, Trump turned in a more measured performance than usual, defending his moderate positions on Planned Parenthood and retaining popular parts of the Obamacare law, perhaps mindful that he is closing in on a victory in the Republican race. He said he would not support a ceasefire deal about to go into effect in Syria and declared that Libya would be better off had Colonel Muammar Gaddafi not been toppled from power by a U.S.-backed uprising in 2011. Pressed on whether he would release his tax records as 2012 Republican nominee Mitt Romney said he should do, Trump said he would eventually do so after a “routine audit” is completed. This did not satisfy Romney, who tweeted that there was no legitimate reason for withholding them even if they were under audit. Rubio went after Trump hard on illegal immigration. He said Trump may talk tough on illegal immigration now, but previously said Romney lost his race against Obama by promoting the idea that illegal immigrants should self-deport. Trump is ahead in the national opinion polls and leads the race with 81 delegates, while Cruz and Rubio share the spoils at 17 apiece. Despite the lead trump has some hurdles to cross to clinch his party’s nomination, which is decided by the number of delegates sent to the July party convention following the state-by-state nominating primary polls. The candidates will have to feed on the nearly 600 delegates at stake at the Super Tuesday contest for anyone of them to secure the nomination with the needed 1,237 delegates.